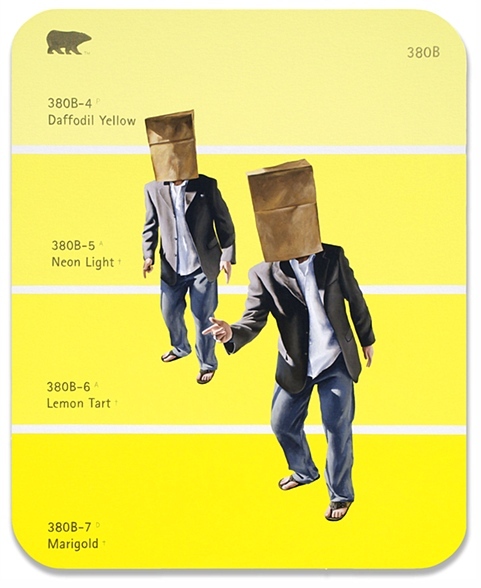 I was first introduced to Shawn Huckins after seeing the Paint Chip Series, featured on The Jealous Curator (great art blog). 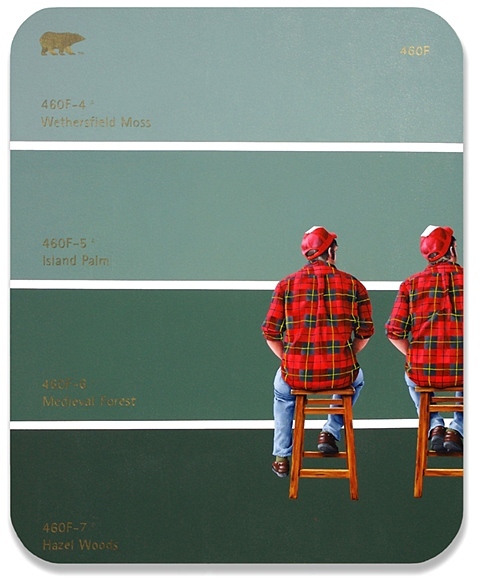 The Paint Chip Series features several large canvases painted to resemble various color swatches you'd pick up at Home Depot or Sherwin Williams before covering your living room in "Pacific Sea Teal." Each "chip" also incorporates some mundane image drawn from the everyday—a Walmart employee pushing shopping carts across a "Sweet Corn" landscape; cars sinking into a "Honey Beige" flood. I have liked British artist, Nicky Hoberman for many years. The facial expressions of the children are somber and serious which makes them so cool. I am also a big fan of minimal backgrounds. Nicky Hoberman's style is a mixture of photorealism and caricature, illogical figures contrasted against even and flat backgrounds interpreted only through their clothes, expressions, and poses. She is perhaps most famous for her effective investigation of the concepts of isolation, identity, and individuality through her art. The last paintings, secret fairies and atomic kitten were the first I saw and when I began to admire her work. Super talented! I discovered Pickart when someone pinned one of artist I like on pinterest. Isn't pinterest lovely? is an artist from Lowell, Indiana. He started off by showing in local art shows and then became a HUGE sensation on Pinterest! He’s been compared to Klimt and Egon Schiele. His images have spread like wild fire and I’m sure his career has as well. I think you can see more of Klimt and Schiele influence in this painting. I haven't posted a "painting of the day" in so long. Here is a good one. Haley Hasler's painstakingly rendered self-portraits often depict her balanced at the precipice of chaos. For many women, these scenes of frenetic domestic life may be exaggerated, but they are also familiar. Hasler’s paintings offer a knowing look into womanhood and modern feminity through narratives and metaphors on identity. Few more by this artist..... I like Hasler's facial expression, which remains the same in her portraits. video which is greatly influenced by Cotton's paintings. My kids love Perry's music but me.... not so much. Will Cotton is an American painter. His work primarily features landscapes composed of sweets, often inhabited by human subjects. South African painter, Philip Barlow has captured the soft focus effect very well. Love it. The figures in the landscape serve as carriers and reflectors of the light that falls upon them. Bathed in the luminosity, it is my hope that they would become more beautiful. To me, light is the ultimate subject because it embodies the pinnacle of all reality. Hyperrealist artist, Steve Smith’s paintings to welcome the summer!